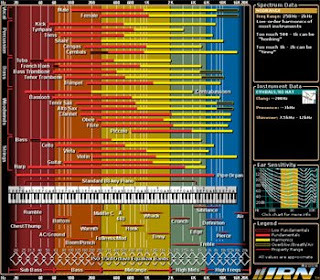 Here's an interactive frequency chart for most common instruments used. Very useful reference tool for both education and mastering. Hi thanks for your good site. I find the frequency chart very useful and would like to save it with your permission, in case there comes a day I'm without internet connection trying to fit that sax into a mix, or your webpage might be down (hopefully never) . Please let me know if you know how I could save it as html. Thanks. hey, I didn't make that freq chart myself, that's only a URL linking to external resource.